Eight different pinnacles are listed in the Legacy that Dr. Beveridge left this state. 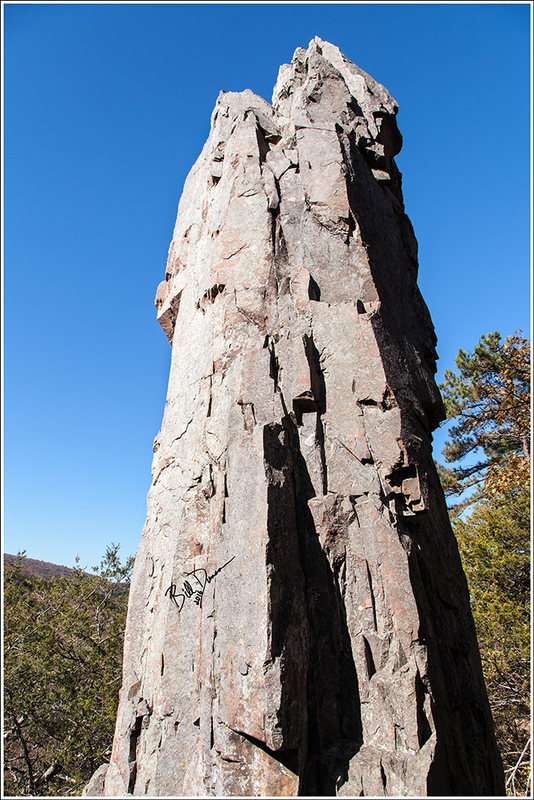 This particular pinnacles, along with associated geological features, is located in the St. Francois Mountains, just a stone’s throw away from a number of other classic destinations of this area. Steve and I had been discussing our potential route for this excursion for quite some time. We had tried once for an overland route but could not find or did not wish to aproach the private property owners and so decided that a water route was the best option for us. This past November, with leaves being mostly fallen and temperatures being much warmer than average, was the perfect opportunity to try out our designed route. 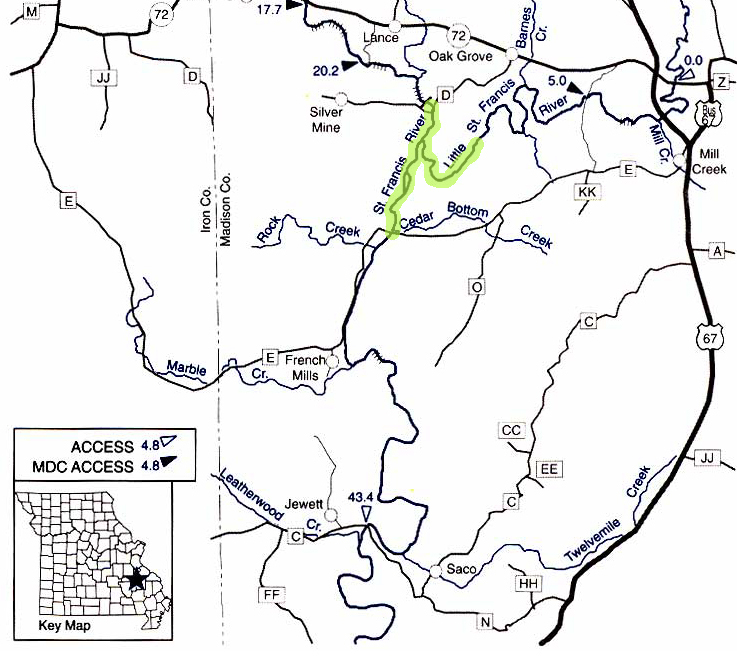 This destination lies on a stretch of the Little St. Francis River (LSF) approximately 1.5 – 2.0 miles upstream from its confluence with the St. Francis River. We knew that water levels were on the low side but we were completely uncertain what this would mean for traveling upstream into the LSF. Would there be any navigable water at all? If not, would it be possible to navigate within its bed by foot? Facing the possibility of failure, we decided to give it a shot. 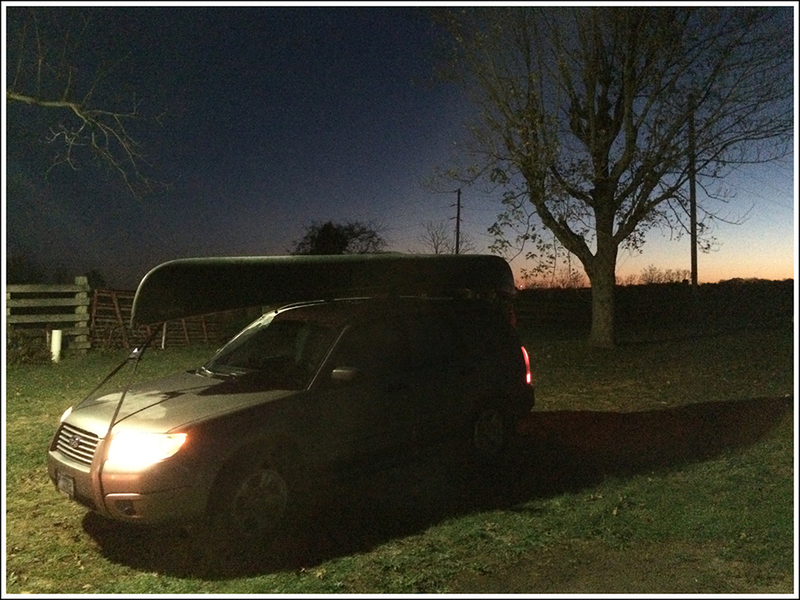 We loaded the canoe onto the powerful, symmetrical all wheel drive Subaru Forester and hit the road. 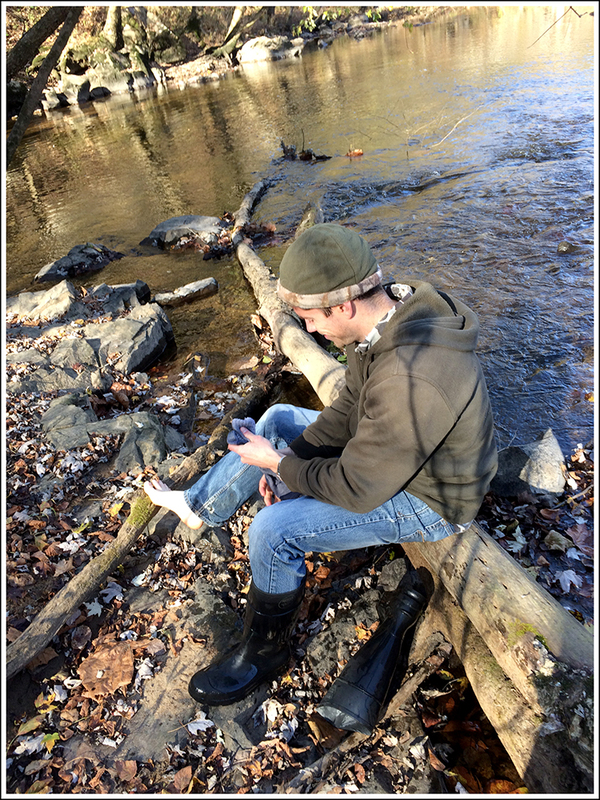 We dropped off Steve’s truck at our takeout – the Cedar Bottom Creek bridge and put into the St. Francis at Silver Mines Recreation Area. With the sun directly in our eyes (as almost always seems to be the case), it was a pleasant and short paddle downstream to its confluence with the LSF. See the following map for the highlighted route that we took that day. Arriving at the confluence, our spirits were lifted. We were forced to push a little to get over a sandbar, but the route upstream was slow and just deep enough to allow for paddling most of the way. We portaged a few times, but we expected worse. 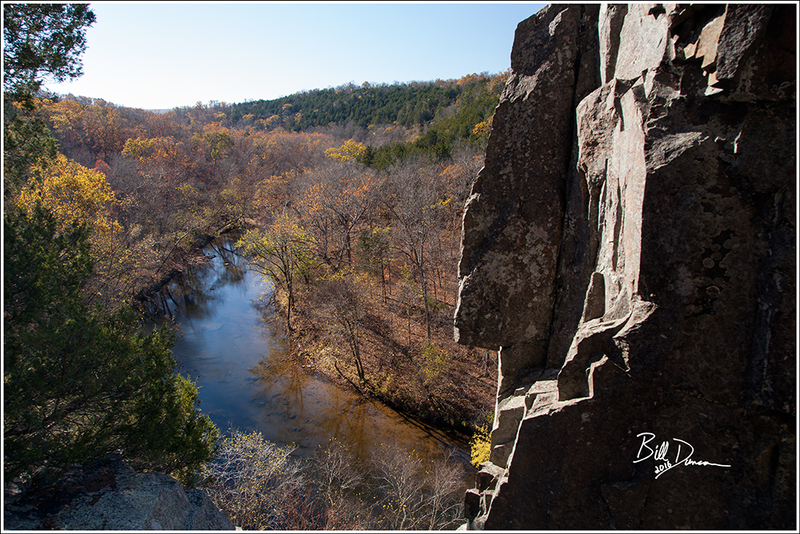 After taking in the initial views of the bluffs, we were naturally drawn to see the pinnacles themselves up close. A quick lung-burning climb and we were there. 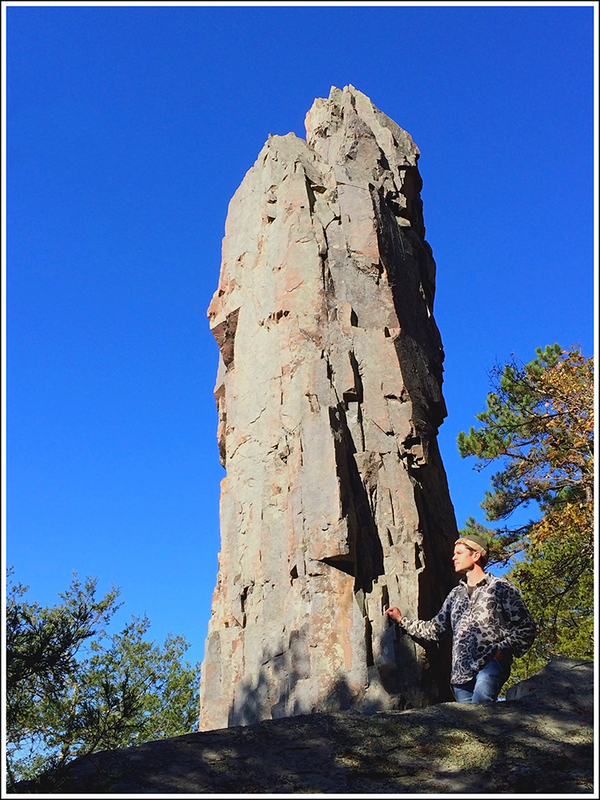 Although not the tallest of these spires, this monolith was the more picturesque. I have other photography plans in mind for this guy if I can ever visit again. See below to see Steve in the frame for scale. The views from atop the bluff were quite nice. 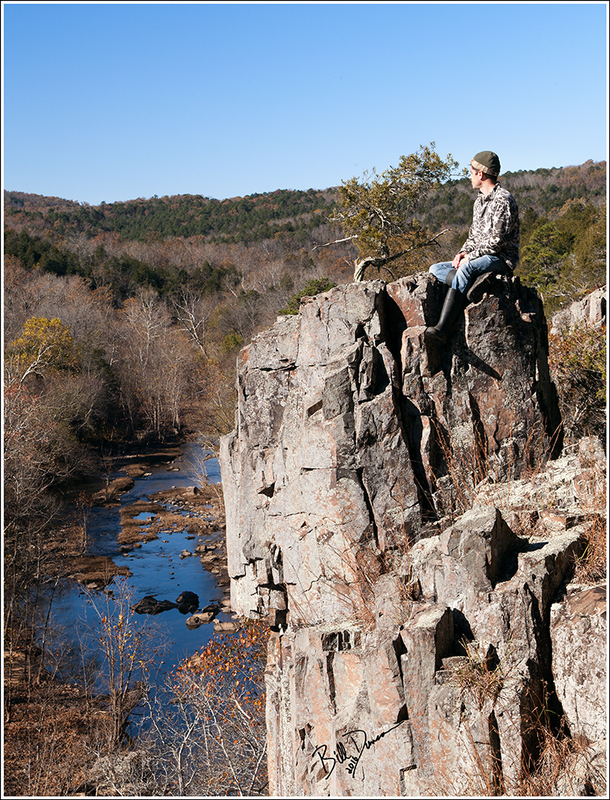 The primary hill that faces south was Tin Mill Mountain and Pine Mountain lies to the north. Here is an example of the rhyolite porphyry that composes the majority of this bluff. This place reminded us a lot of Lee’s Bluff, which was not surprising due to how close these locations are to one another. However, the pinnacles here brought a bit more visual interest. Here Steve poses with a small, but likely ancient cedar, clutched within a crack that is probably older than the human species. 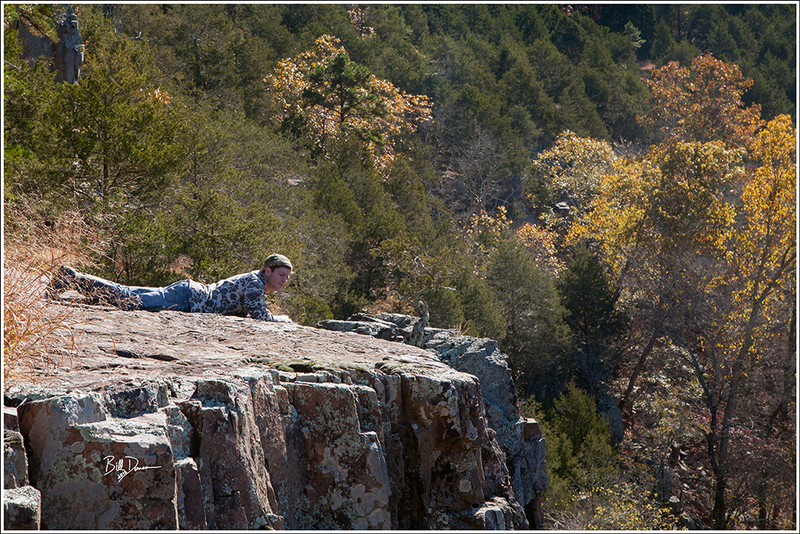 To conclude, here I captured Steve doing a belly crawl to the edge of the bluff. As I say so often, I long for another visit here. It seems the LSF has several other features to share. I hope we can one day float the entire ~15 miles with a couple or more feet of water. There are apparently a couple of stretches of shut-ins that shouldn’t be missed. The Strawberry Bush is a rather new one for me. 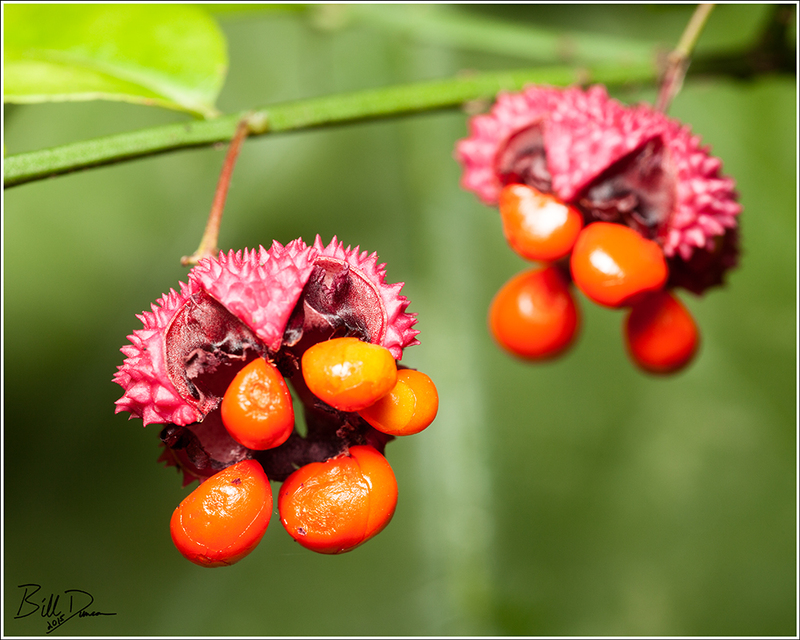 Steve and I found these plants, with freshly opened fruit capsules along the St. Francis River within Millstream Gardens CA this autumn. Rare due to loss of preferred habitat, this plant prefers moist, sandy soils along stream banks. 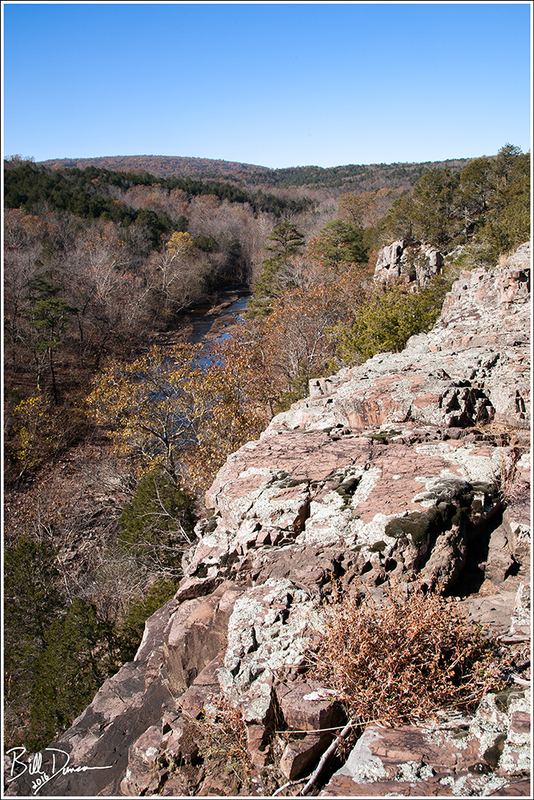 Along with the St. Francois Mountain region, this plant also grows in extreme south-eastern Missouri. 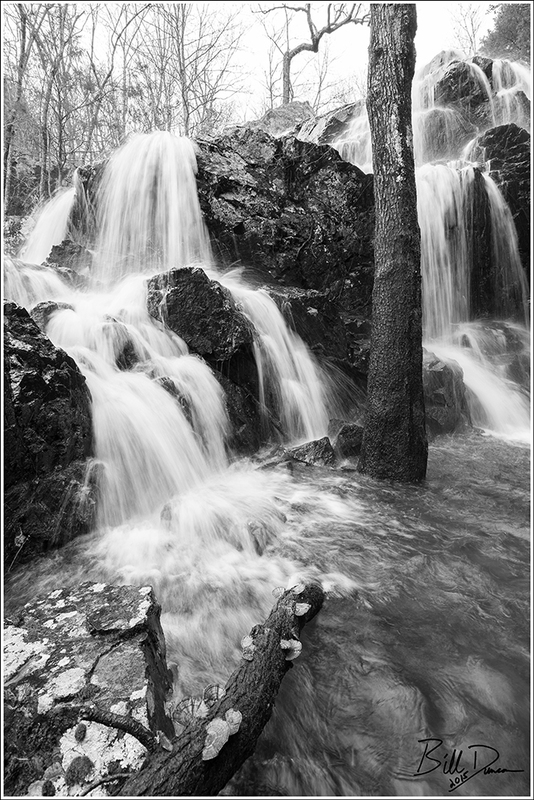 A few from a trip up Black Mountain Cascades this spring. 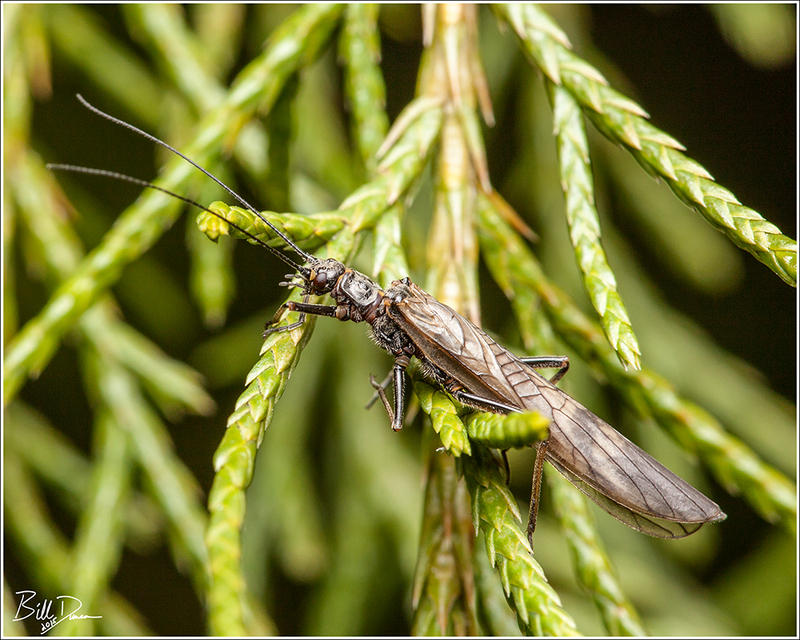 While looking to photograph pollinators of Ozark Witch Hazel, Steve and I came across this Winter Stonefly, which is definitely not a pollinator. 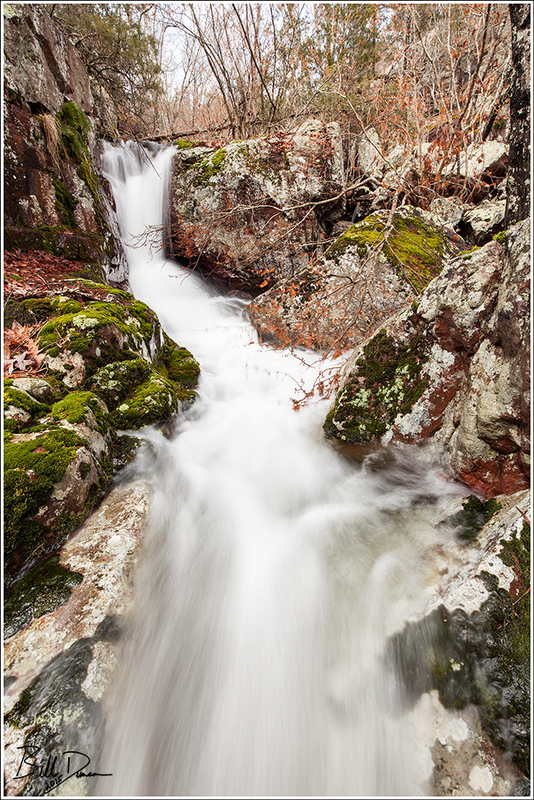 This photograph was taken on February 7th near Silver Mines Recreation Area. Just kidding. 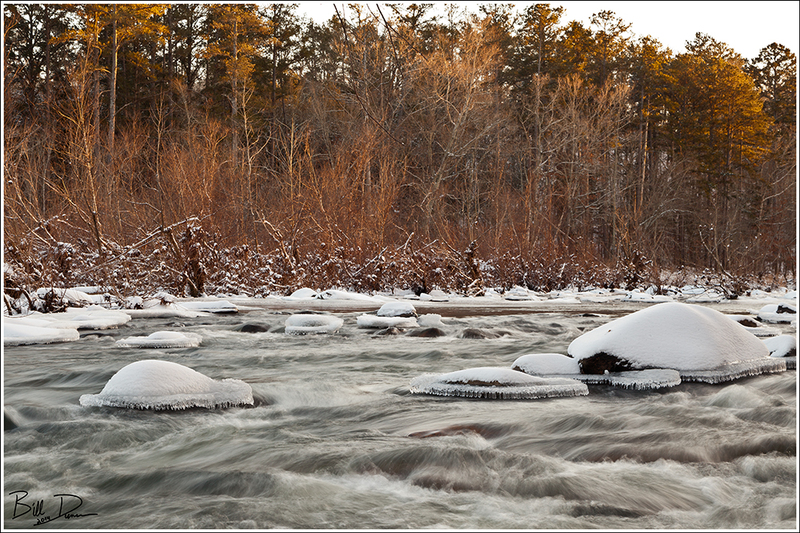 This is what was happening on the St. Francis River near the end of one of this winter’s glorious days. 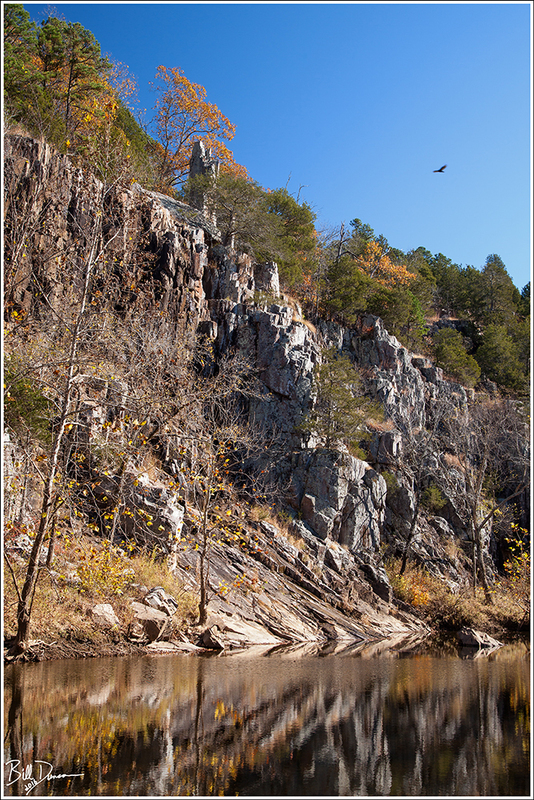 Pictured below is a view a little farther upstream. No, Steve and I did not take a daytrip to make it to the summit of K2 or one of the other Himalayan peaks, although we easily could. 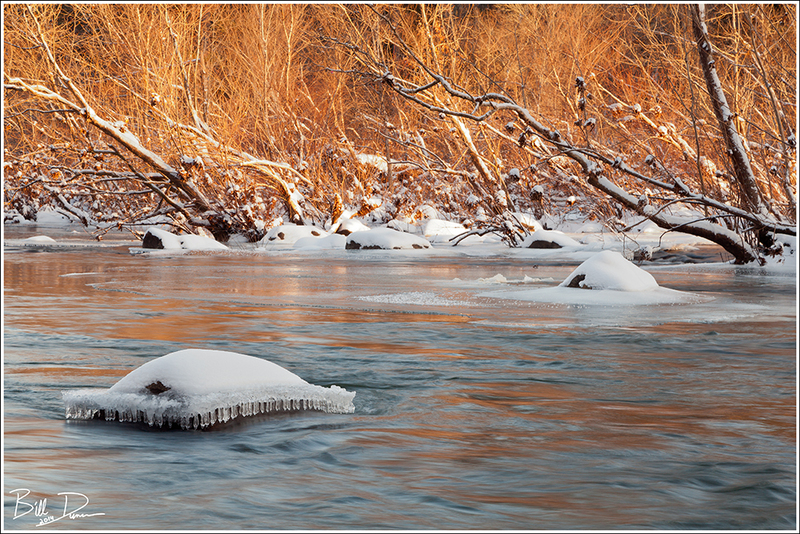 This image was made on one of this winter’s sub-zero days at Elephant Rocks. I had an idea of the image I wanted to make that may showcase an optical effect that Galen Rowell made famous called “diffraction fringe“. 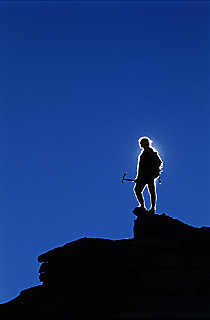 By putting oneself in the shadow of your back-lit subject at just the right difference and position, one may see a ring of hot light that outlines the silhouette of the subject. This proper geometry of sun, subject and camera (including optical settings) is just one requirement to observe and capture this effect. The other, as far as my understanding allows is the need for dry, clean air. 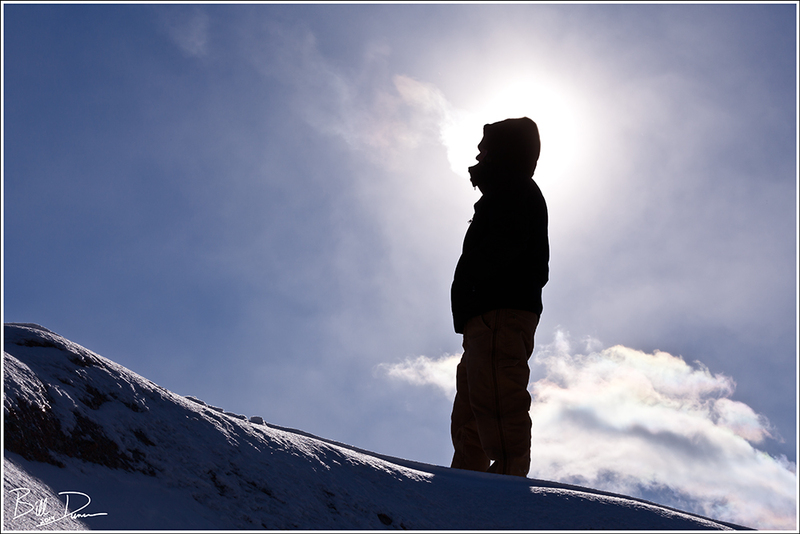 On this particular day we had temps below zero degrees Fahrenheit and the air was as dry as could be with no interference from any noticeable smog. With the air quality requirement met, it was simply a matter of trying to position the model (Steve) at the correct position between myself and the sun. This part was more difficult in this setting and ultimately led to us missing our ultimate goal. Trying to work this out in minus 30 degree windchill proved our undoing. I could only ask Steve to climb so many boulders in this type of weather, which seemed to be increasingly affecting our mood and thought process the longer we were in these elements. Ultimately, I did not achieve the diffraction fringe. I am not sure as to the reasoning for this failure. 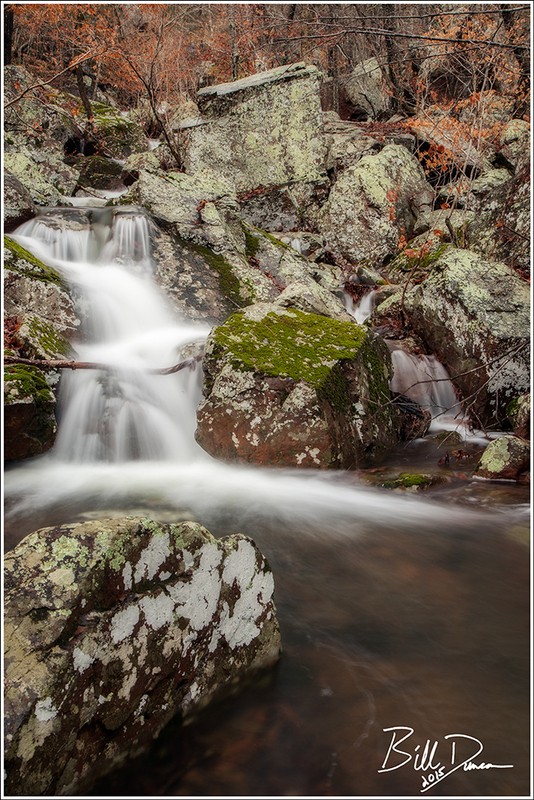 I feel the geometry of our positioning, afforded by the placement of boulders and the limited availability of where I could position myself was the biggest factor. Getting the required distance that I believe necessary was impossible. Other factors that could have played a part were not having the most appropriate focal length and aperture settings, the air quality not being as suitable as I thought and perhaps the quality of the optics I was using. Many of these optical phenomena are the result of imperfection in lens design. 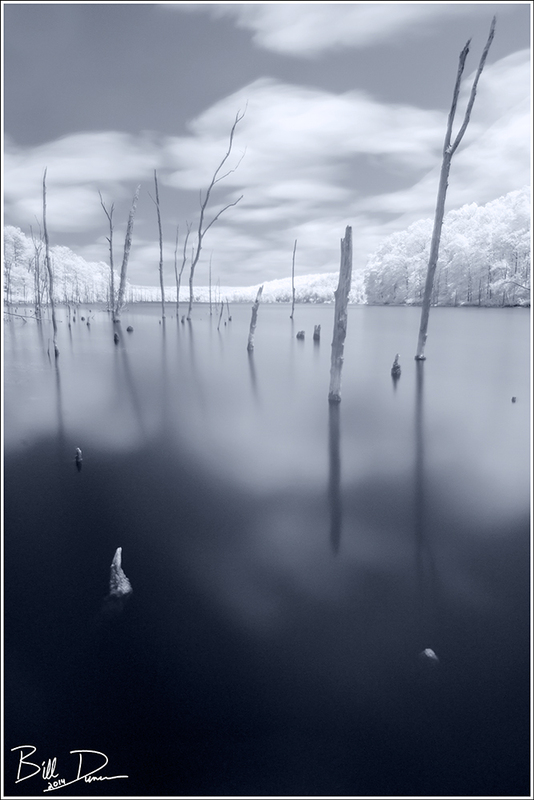 Galen took most of his images with older generation optics that were often lower quality compared to today’s standards. I’m not exactly sure what the reason for the failure in acquiring this diffraction fringing was. I guess this was just a very long explanation of an image I thought turned out to be pretty successful anyway. I look forward to trying this one again one day.